Migration is heating up on the Gulf coast. Twice each year, billions of birds, entire species, swarm across the globe, traveling thousands of miles as they migrate between breeding and wintering grounds – stopping en route to refuel at coastal stopover sites. Every year this spectacle attracts hordes of local and out of town birders who descend upon stopover sites throughout the migration corridor along the Gulf Coast. 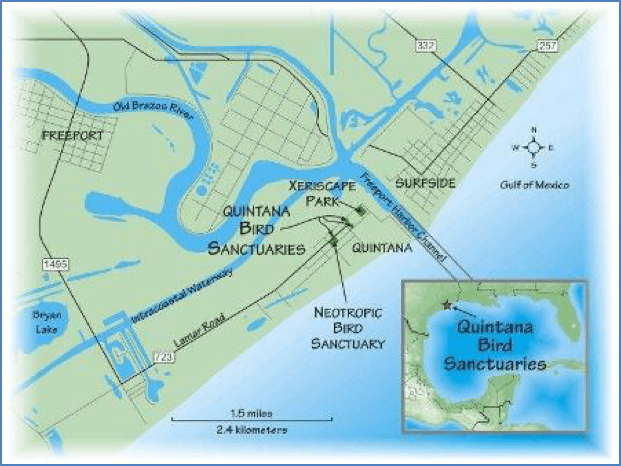 At GCBO, we manage our own patch of stopover habitat – the bird sanctuaries at Quintana just ten miles south of our Lake Jackson headquarters. Because there are few visitor services in the small community of Quintana, we host a month-long Spring Fling Visitor Station each April. GCBO staff and volunteers assist with bird identification, provide local information and bird checklists, sell snacks and field guides, and post a daily bird list. What will April bring? Come and find out for yourself! The Spring Fling Visitor Station operates daily during the month of April.